The Andes, Iguazu and La Ley: what more could you want? 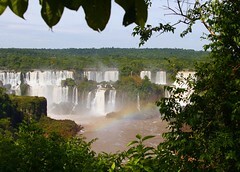 Recently I had the chance to travel to South America – mostly to Brazil, so that was great for my Portuguese, and to a lesser extent in the Spanish-speaking part: Chile and Argentina, to take in the Argentinian side of the Iguazu Falls (Iguaçu in Portuguese), which, let me tell you, are spectacular. Below are a couple of pics I took with my iPhone, which got a soaking during the day. I was also very lucky to have a window seat while flying over the Andes mountains at sunset (heading east from Santiago to Rio de Janeiro). At the top of this post, and below, are two of the photos I took on that memorable journey. While I was in Chile I was excited to find out that my favourite Chilean band – in fact, my favourite Spanish-singer artists in the whole wide mundo – La Ley, had re-formed and brought out a new album this year, called Adaptación, their first since 2003. Here’s my favourite track from it. There are 12 songs on the album, two of which are in English. The opening track is also appealing. Here’s a studio clip of it. I hope you enjoyed this visual and aural foray into South America. How’s your Brazilian slush fund looking? Bernardo still holds hope that he will soon win the lottery and will actually be able to afford to go to the World Cup in June 2014 in Brazil, where he will be able to practise his Portuguese with the locals, and his Spanish and Italian and possibly his French and Romanian with all those visiting fans. No doubt when Bernardo arrives in Brazil people will find him charming and pleasant to talk to and will want to buy him a beer or two. Possibly even a meal. As long as they don’t expect him to buy them anything in return, all should be fine. Bernardo had an anxious time earlier in the week wondering which team he would support if Portugal and Romania (two of his favourite countries) were drawn together in the play-offs that will decide the last four European teams to qualify for the World Cup soccer tournament in Brazil next year. What would you prefer, two of your sentimental picks being paired together, thus guaranteeing that at least one will be there, or would you want them kept apart in the hope that both could make it – but also having to face the danger that none of them will make it? Have faith in your two favourites, that’s what Bernardo says. Before the last round of group matches, Portugal had been certain of a place in at least the play-offs, but Romania had to beat Estonia and rely on the Netherlands not losing to Turkey to progress. On a nail-biting night, Romania won and Turkey lost. Bernardo also had to face the possibility that France, a country he likes and one that is very relevant to this blog, would be drawn against Portugal. Bernardo was a great fan of France in the Michel Platini era (in the, ahem, mid-1980s), but has kind off gone off them now, for some reason. Bernardo doesn’t like it when the same teams win trophies over and over again – and he always wanted France to win a World Cup. Once they achieved that (in 1998), it no longer seemed so urgent. As it happens, those three teams were kept apart. Portugal were drawn against Sweden (who will be formidable opposition), France have a tricky tie against Ukraine, Romania play Greece and the final pairing is little Iceland against Croatia. The matches take place in mid-November. The four winners will join Belgium, Italy, Germany, the Netherlands, Switzerland, Russia, Bosnia-Herzegovina, England and title holders Spain as the European contingent in Brazil next June-July. It was great to see Spain finally win it last time round in South Africa – Bernardo had been tipping Spain to win it for at least a decade, before that – they had such great players (Raul, Luis Enrique, Morientes et al). Great, too, that the tournament was held in Africa. The Asian zone teams that qualified are Iran, Japan, South Korea, Australia. Turning to North and Central America, The United States, Chile and Honduras will definitely be in Brazil, and the fourth-placed team in their qualifying zone, Mexico, have to play off against Oceania winners New Zealand. Mexico are lucky to still be in with a chance. Really, Panama should be playing New Zealand instead. In their last game, Panama were leading the US 2-1 in extra time but amazingly conceded two goals in the 93rd and 94th minutes of the match to blow the opportunity. They must be kicking themselves. Which leaves Africa. The first legs of the final deciders have already been played and the return legs will be in mid-November. Ghana thumped Egypt 6-1 so should be there, but the other matches finished thus: Burkina Faso 3 Algeria 2; Côte D’Ivoire 3 Senegal 1; Ethiopia 1 Nigeria 2, and Tunisia 0 Cameroon 0. Incidentally, Brazil are the only team to have played in all the 19 World Cup tournaments held so far. 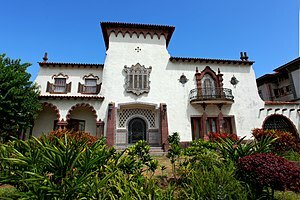 The first was in 1930 and it is held ever four years, but the 1942 and 1946 ones were not held because of the second world war. Brazil last hosted the tournament in 1950, so today’s sports fans all over the world will finally get a good look into Brazilian language and culture. So if your national team is going to be there or is still in the running, we might see you around in Brazil some time soon (you’re going to win your national lottery too, right?). But if your nation has missed the boat to Brazil, well, good luck for Russia, which will be hosting the tournament for the first time in 2018. Start putting your coins in your piggy bank for that one now…. All that sizzling seaside poetry by Sophia de Mello Breyner Andresen in my previous post made me want to strip off my clothes, pull on my cossie and run down to the beach. But it would have been a 14km run so I resisted. I let my nose do the running instead (I have a cold). However, Sopia’s lines about waves breaking made me recall one of my favourite Brazilian rock songs, Até o fim do mundo, by a band called Os Gurus. It was on one of the many compilation CDs linked to the popular Malhação TV novela (soap opera), which ran from 1995 to 2013. The CDs – at least one was released every year – are great for anyone who is seeking an introduction to contemporary pop/rock artists from Brazil. The song contains one of my favourite words, mergulhar, which means to dive, dive in, plunge, dip, immerse, etc etc. 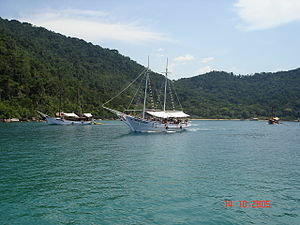 The first time I heard that word was when we were doing a day trip on one of those schooners that sail in the bay around Paraty, on the coastline known as the Costa Verde (Green Coast) that runs from Rio de Janeiro to Santos. This area is one of the most beautiful parts of the world. An old English couple (in their late 60s or 70s) on board were with a young guide/chauffeur whom they had hired on the spur of the moment on their arrival at Sao Paulo airport. The schooner had dropped anchor, and everyone was hovering aimlessly, wondering what to do next. I was dying to swim, and was wondering if it would be impolitic to ask if sharks were a problem in Brazil. The young guide said “Vamos mergulhar” and took the plunge. It was the sign we all needed, and we followed suit, jumping like lemmings into the water and losing our inhibitions. 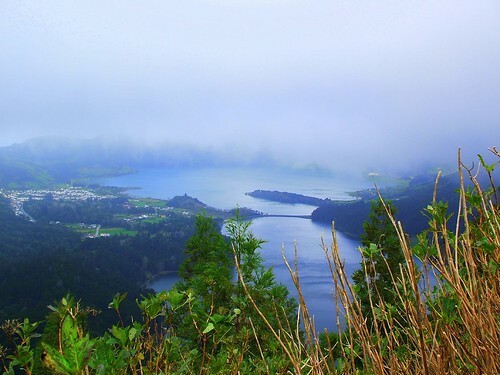 That day was one of the best of my life, and it was the best-value tourist experience I have ever had – the outing cost only about the equivalent of $20 Australian, including the lunch that was served on board. (These are prices from 2003, when Brazil’s currency was comparatively weak; I am sure it is a different story now.) 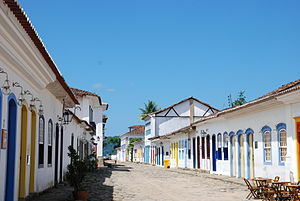 If you ever get the chance to see Paraty, please take it. Em plena tempestade, te vejo mergulhar. Fugindo das verdades, que não param de chegar! If you go on holiday to Brazil you should at least know the following vocabulary from the song: ondas = waves; mar = sea; tempestade = storm. Other useful words are: cidade = city; verdade = truth; caminho = road or path or as a verb, I walk; encontrar = to meet, encounter, find; saudade = Portuguese-style nostalgic longing; lugar = place; alguns = some (plural); qualquer = any; escutar = to listen; plena = full; vejo = I see; segundo = second; até = towards; fim = end; mundo = world; quem = who. The “-ando” and “-indo” words are present participles. Olhando = seeing; tentando = trying; fugindo = fleeing. Fala and diz are the third person singulars of the verbs falar (to speak) and dizer (to tell). Param is the third person plural of parer = to stop. You should understand the whole song now! By the way, to swim is nadar, and the word for shark is tubarão. Below is a YouTube clip of the band performing the song. However, it sounds different to the CD version – there are fewer effects in the chorus, for example – and I don’t find this as appealing. But at least you can see the band in action. 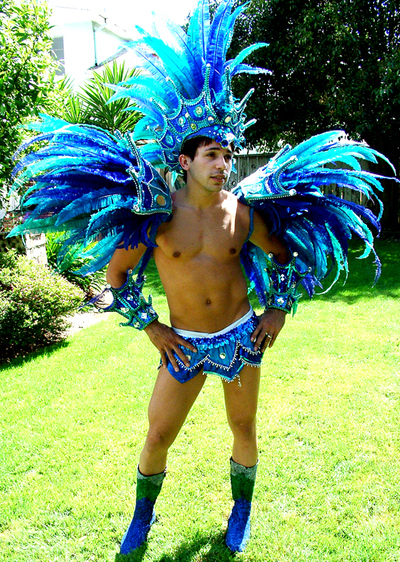 Boots and all: When you go to Brazil you don’t need to pack many clothes, apart from lots of feathers. That way you will be well under your allocated luggage allowance. The good news this week, as far as this blog is concerned, is that Australia finally qualified for football’s next World Cup, to be hosted in Brazil next year. Or Brasil, as the country is called in the Portuguese language. This means that here in Australia we will get a lot more coverage of Brazilian culture, language and society – hopefully beyond the stereotypical view that it is the land of samba and carnival – and we should get some good armchair travelling in too as broadcasters provide television footage of the 12 host cities and background scenes. If we hadn’t qualified (I use the term “we” because I always like to claim some of the credit) then we (um, I) would have felt deflated and probably our (um, my) interest in the Portuguese language would have waned, certainly in the lead-up to the event. Once kick-off comes I doubt anyone with a love of football and Brasil can remain aloof. 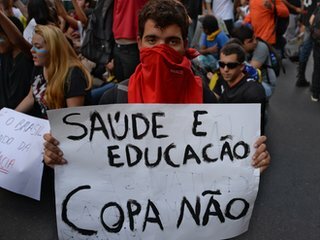 In the meantime, Brazil is currently hosting the Confederations Cup (a contest between the champions of soccer’s six regional confederations, plus the World Cup winners and the host nation, which is usually the country that will host the next World Cup) and is generating unwanted publicity because there have been massive protests across the country against recent hefty increases in the price of public transport, and the cost of staging these international sporting events. The police have responded with teargas and rubber bullets, and there have been accusations of police brutality. The Brazilian authorities have been very naive: one of the main laws of political deviance is that you never announce anything unpleasant just before you are about to go into the international limelight. The authorities should have kept quiet until the Confederations Cup was over and then hit the pesky public with the fee increases. D’oh! Bend it like Bedlam: the warm-up to the World Cup in Brazil. 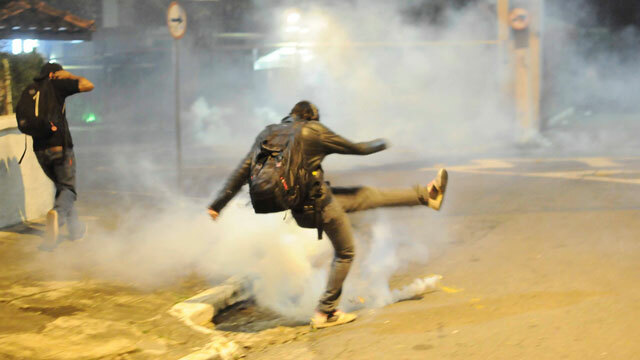 A protester shows off his football skills (using his left foot, no less) to kick away a teargas canister. Brazil scores an own goal! 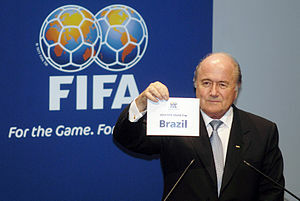 So, what other countries will be in Brazil in 2014? The four qualifiers from Asia are Japan, South Korea, Australia and Iran. No surprises there, although poor old Uzbekistan (one of the “-stan” countries that I have a soft spot for, for no logical reason) were unlucky. They had the same number of points as South Korea but an inferior goal difference, and will now have to play off against Jordan (another country I am fond of, owing to a previous visit) first, then the winner of that match will play off against the fifth placed team in South America. In the other regions there are still many qualifying games to play and a much clearer picture should emerge by September and October, but this is how it looks at this stage. In South America, the nine nations competing in the qualifiers still have three or four games each to play. However, Argentina, Colombia, Ecuador and Chile look to have secured the four qualifying spots, while one of Uruguay, Venezuela or Peru will meet the winner of Uzbekistan v Jordan in a two-legged play-off in November. In the North and Central American region, the six teams each have four games to play and anything could happen. But the United States and Costa Rica are on track to clinch one of the three automatic qualification spots. Mexico, Honduras and Panama are vying for the third place, and the fourth placed team will meet Oceania champions New Zealand in November for the right to be in Brazil. In Africa, the winners of 10 qualifying groups will go into five play-offs to decide which five teams will be in the finals. Already into the play-offs are Ethiopia, Tunisia, Côte d’Ivoire (Ivory Coast), Egypt and Algeria. 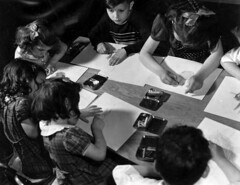 The other five places will be decided in the next and final round on September 6. In Europe, 50 teams are still mathematically in contention for the 13 qualifying places available. There are nine groups, the top group in each will qualify and the next eight best teams will have to play off to eliminate four. However, the ones that look certain to qualify at this stage are Italy, Germany, the Netherlands and Switzerland. If you are going to Brazil for the World Cup or Carnival or the 2016 Olympics, you had better start practising your dance moves. You might be called on in public parks and on beaches to join in an impromptu prance around, and you don’t want to make a fool of yourself. 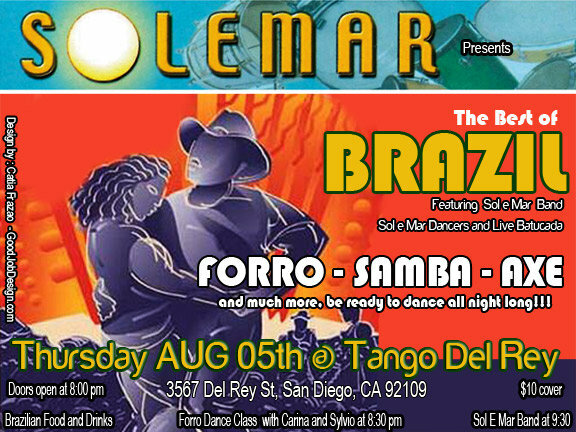 And you should be familiar with not just Samba, but Axé music, Pagode, MPB (Música Popular Brasileira), Forró and other genres too. It is very important that you get into shape and practise your hip movements and pelvic thrusts in particular. Watch these videos and you will understand why. Hopefully, by the time the World Cup starts a lot more people in the world will have come to realise that in Brazil they speak Portuguese and not Spanish, and public transport will be more efficient and more affordable for the masses.